Given enough facts, the Marquess of Glenaire can fix anything. 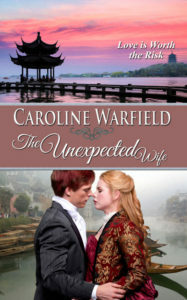 One impossible woman is proves to be almost as hard to protect as his heart, especially when Lily’s problems bring her dangerously close to an Ottoman revolution. 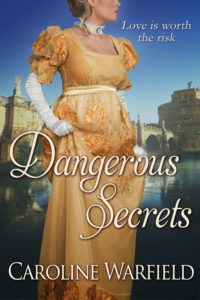 As Lily’s personal problems entangle with Richard’s professional ones, and she pits her will against his, he chases her across the pirate-infested Mediterranean. Will she discover surrender isn’t defeat? It might even have its own sweet reward. Major Lord James Heyworth fled to Rome. Behind him lie disgrace, shame, and secrets he is desperate to keep even from powerful friends in London. He accepts employment as an interpreter just to have money to eat. Nora Haley, his employer is a widow. She came to Rome to help her dying brother and protect his daughter. She can’t trust any man who drinks. She had enough of that in her marriage. She fears deception will destroy everything she desires. Either one, however, will dare anything for the tiny girl in their care. They will even enter a sham marriage to protect her. Will love—and the truth—bind them both together? 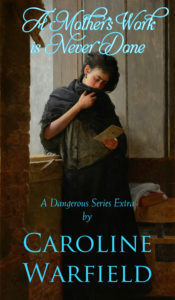 The heroes and heroines of Caroline’s DANGEROUS SERIES overcame challenges even after their happy ending. Their children seek their own happiness in distant lands in Warfield’s new CHILDREN OF EMPIRE SERIES. 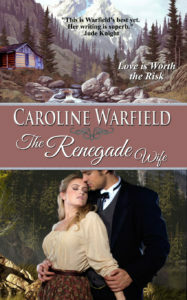 In THE RENEGADE WIFE, first of the new series, reclusive Rand Wheatly finds contentment in his remote cabin in Upper Canada, intent on making his fortune in timber, until his precious solitude is disrupted by a woman running from an ugly past. He quickly realizes she wasn’t what she claims, but now she’s on the run again and time is running out for him to save her. When Captain Fred Wheatly, a soldier with more honor than sense, is forced to resign from the Bengal army, and his mistress dies leaving him with two half-caste daughters to raise, he reluctantly turns to Clare Armbruster for help. But the interfering widow has her own problems, and a past she would rather forget. With no more military career and two half-caste daughters to support, Fred must return to England and turn once more—as a failure—to the family he let down so often in the past. 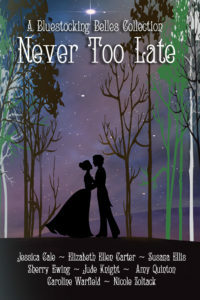 Can two hearts rise above the past to forge a future together? Love as impossible as it is unexpected. The Earl of Chadbourn feels trapped managing his widowed sister’s ruined estate and grieving son. Loneliness overwhelms him, but the woman who handles the neighboring farm brilliantly draws him like a moth to flame. Catherine Wheatly has her own problems—two mischievous brothers, a neglectful father, and a questionable birth. With Christmas coming, Catherine’s brothers pull his withdrawn nephew you into their schemes and threaten havoc in the barnyard, the earl’s sister refuses all celebration, and Catherine’s father withholds old family secrets. Can Will and Catherine work together to repair the damaged estate and far more damaged family? Dare they hope for love in the bargain? Previously published in Mistletoe, Marriage, and Mayhem. 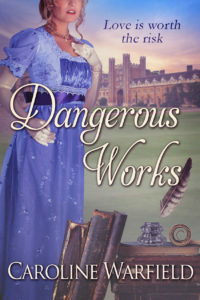 The prequel to the Dangerous Series introduces three boys who grow into heroes who seek their own happiness in Caroline’s Children of Empire Series. 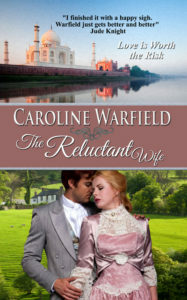 Can the earl find enough wisdom to calm a young man’s fears, and strengthen his marriage in the process? 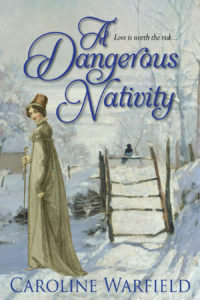 This short story carries the characters in Warfield’s A Dangerous Nativity forward. 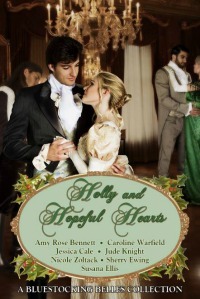 An Open Heart presents two people who don’t celebrate the same holiday as the other folk at a Regency house party. Esther Baumann longs for a loving husband who will help her create a home where they will teach their children to value the traditions of their people. It is 1812, and Chanukah fell the month before she arrives at the Duchess of Haverford’s house party. She’s open to what the house party might bring. Tradition is important, but Esther also wants a man who is also open to new ideas and happy to make friends outside their narrow circle. Is it so unreasonable to ask for toe curling passion as well? Adam Halevy prospered under the tutelage of his distant cousin, powerful banker Nathaniel Baumann. He’s ready to find a suitable wife, someone who understands a woman’s role, and will make a traditional home. Why is Baumann’s outspoken, independent daughter the one woman who haunts his nights? 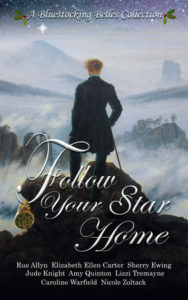 When a business trip forces him to open his mind to new ideas and he arrives home to find Esther gone, what can he do? He follows her to the Duchess’s ball unannounced.